Windows 10 Creators Update (version 1703) is currently available for download via Windows Update Assistant utility and Media Creation Tool. While the Update Assistant utility helps you upgrade to Windows 10 Creators Update, the Media Creation Tool allows you upgrade to Windows 10 Creators Update as well as download its ISO files. Since Windows 10 Creators Update ISO is available for download, many computer users are performing a clean install of Windows 10 Creators Update on their PCs as well as Macs. According to Apple, Mac users are experiencing issues while attempting to perform a clean install of Windows 10 Creators Update on Mac machines using the official Boot Camp Assistant. Because Boot Camp is currently not compatible with Windows 10 Creators Update, it’s currently not possible to perform a clean install Windows 10 Creators Update on Mac using Boot Camp Assistant. It looks like many Mac users are stuck with a blue screen after attempting to clean install Windows 10 Creators Update. According to Apple support, Microsoft and Apple are currently working to resolve the issue, and the company will update its software soon to support Windows 10 Creators Update. 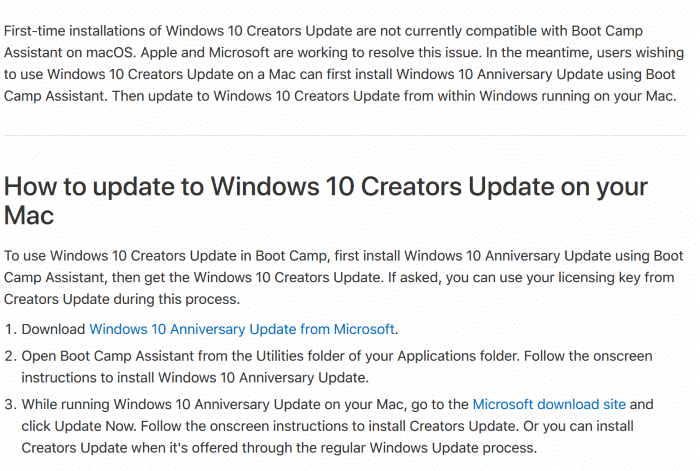 Now that it’s impossible to clean install Windows 10 Creators Update on Mac using Boot Camp Assistant, Apple suggests you perform a clean install of Windows 10 Anniversary Update (version 1607) and then use the Update Assistant or Media Creation Tool to upgrade to Windows 10 Creators Update if you wish to install Windows 10 Creators Update on your Mac. So, if you wish to install Windows 10 Creators Update on your Mac using Boot Camp Assistant, here is how to get it. Step 1: Download Windows 10 Anniversary Update ISO from Microsoft. Step 2: Use Boot Camp Assistant to install Windows 10 Anniversary Update on your Mac. You can refer to our how to install Windows on Mac using Boot Camp guide for directions. Step 3: Once your Mac is running Windows 10 Anniversary Update, download Media Creation Tool. Run the Media Creation Tool. Tip: Follow our how to get Windows 10 Creators Update right now guide for directions. Step 4: Choose Upgrade this PC now option and then follow on-screen instructions to upgrade to Windows 10 Creators Update. I had Windows 10, 64 Bits, version 1607 completely updated installed on my Bootcamp partition before attempting to update to version 1703, using the Windows Update Center. I have the latest version of Parallel Desktop for Mac. I have a late 2013 MacBook Pro with 16 GB RAM, 1TB SSD and Mac OS X 10.12.4. I must have tried 3 or 4 times to let Windows update Center attempt to install the version 1703 update while running Windows in Parallel Desktop for Mac, to no avail. I went through the process, restarted when prompted to and the update always failed to install. Then, I decided to boot straight into Windows (Bootcamp), do a chkdsk /b, reboot and go to Microsoft download page and downloaded the update rather than use the update center routine. I then installed it, always while booting straight into Windows at every restart and it worked. I thought I’d share this with you. Good luck to all.